Constitution protects our rights of freedom of speech and justice; it should also protect the right to have a healthy, undisturbed sleep at night. Many of us are able to claim this right only after blocking the cat out of the bedroom. Unfortunately, this does not always happen as intended. As soon as you close the bedroom door, cat scratching and meowing can reach unbelievable levels, eventually ruining your night and damaging the door. He usually ends up being let in anyway. Is there a way to stop this? Yes, absolutely! 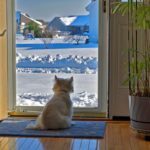 This article will teach you how to stop your cat from scratching bedroom door at night, which will help you sleep better. 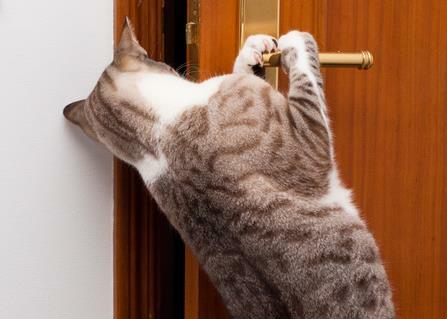 What do you do when your cat is scratching at the door? Do you let him in? Do you yell at him or punish in some other way? Do you open a tuna can? Whatever it is: Don’t do it! Your cat is not trying to enter the room because he has to be everywhere. (Well, actually he does, but that’s beside the point.) Your cat wants your attention. 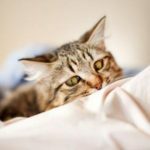 Even if you yell at your cat, or even if you beat him (don’t hit your cat, please), it’s still attention, and your cat will be getting what he wants. Do you know what happens when a cat gets what he wants? He will remember what he did to do to get it, and repeat that action whenever he can. Which leads us to a conclusion: If you provide ANY attention, your cat will scratch at the door MORE. Ignore your cat completely. Within several days, provided you also follow the advice below, your cat may learn that his tries lead to no results, at which point he will try it less and less. Yes: this also means you have to feed your cat in meals. The beauty lies in the fact that you actually play, for at least (but more is recommended) several minutes before every meal. 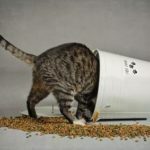 One of the biggest benefits of playing with your cat (find out about others here) is that he will expend energy during the activity, which will stimulate his natural cycle of activities. Wild cats start meals with a hunt. They can’t eat anything before they catch something. Does that make sense? After a meal, they have to regain the energy spent during the hunt, so they groom themselves and go for a nap. 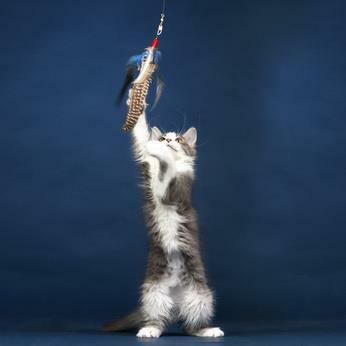 If you play with your cat before every meal, he will understand how the day works and will be less troublesome at night. Remember: the FINAL meal of the day comes in the very last minute before YOU go to sleep. It is best if your cat finishes only when you are in bed and pretending to be asleep. Motion activated pet deterrent “sssCat” will keep your cat away from door at night. The simplest way to stop your cat scratching the door at night is to close the door and place a device called “sssCat” on the floor next to it. What is it? 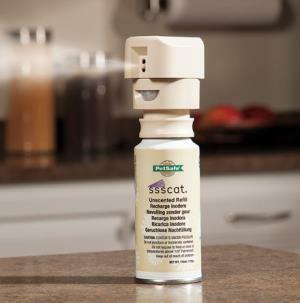 sssCat is a motion-activated pet deterrent that releases a burst of air every time anyone comes closer. Do you copy? Your cat comes to a bedroom door, tries to scratch at it, but sssCat lets loose a burst of air. Your cat will not try scratching again very soon, and even if he does, sssCat will do its dirty job again… and again. What this device provides is consistency, and in any training, consistency is key. Pretty soon your cat will understand that the door is not a very friendly creature at night, and will not even try to approach it. You can buy sssCat here . Another thing that many cats don’t like is a runner mat placed with pins up next to a door, and/or double-sided tape stuck to the door. Cats don’t like putting their paws on either of them, and if the door is covered with sticky tape, he will not want to scratch at it. You can find more ways to keep your cat out of the bedroom here. Even as you try to scare your cat out of the bedroom, make sure you do not make him miserable and stressed. Make sure he has something to appreciate in his part of the house available at night. What about a cat tree? 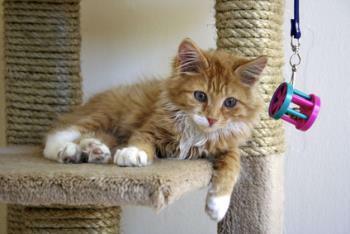 Get more than one, and install some shelves on the walls so that your cat can climb, jump, and perch. Add some opportunities for solo play by tossing fake mice and other cat toys around. Click here to find other ways to “catify” your home. How soon should you expect results and stop your cat from scratching bedroom door at night? In most cases, you will see some improvement within a few days. Barring that, if you stick to the above advice, your cat’s behavior should change after two weeks. Of course, even after that, you will still need to play with your cat a lot, to prevent him from waking you up at night again. 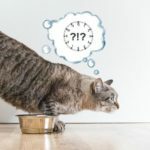 How to start scheduling your cat’s meals?